Isiah Factor | The Insite » INSITE PICTURE OF THE DAY: MONEY TO WASH! INSITE PICTURE OF THE DAY: MONEY TO WASH! May 28, 2010 | Posted in Uncategorized | Comments Off on INSITE PICTURE OF THE DAY: MONEY TO WASH! THE CITY COULD SAVE MONEY IF THEY DROVE THROUGH THOSE NO FRILLS CAR WASHES AT THE CORNER EXXON! For months Mayor Annise Parker has been tackling the tough issue of balancing the city’s budget in Houston. After some penny pinching the $4 billion budget was solid. But if city leaders still need a few extra dollars I know how they can save…stop sending city owned vehicles to full service car washes. 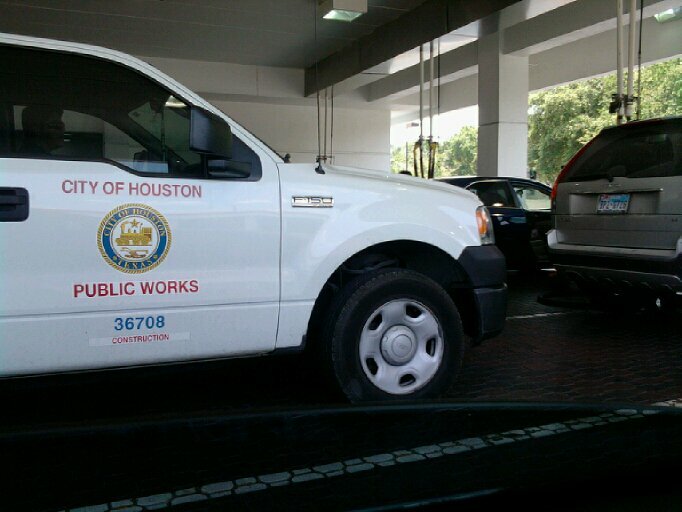 Here’s a picture of a Public Works vehicle going through the wash on Kirby near Westheimer. The average cost is about $20 per car. Imagine how much the city could save if they used that no frills wash at the gas station or detainees at the jail who may want to work off fines…This could save thousands unless the city has a heck of a deal with this full service car wash!